Nothing To See Here ! Two Vases one made from Birdseye Maple & Black Wenge and the other Vase is made from London Plane and 4000 year old Irish Peat Bog YEW. Very pleased with the result. Both treated to a bit of Danish Oil and tomorrow I will start to Beeswax them. Hope you find them of interest. Regards BARRY. Very nice…did you use the patterns from Steve Good or is it your design? Hi Larry yes sure its a Steve Good pattern but I have messed about with it re sized it re shaped it and changed the front cut out design to a Tulip. Only finished them an hour ago and still needs waxing and they have sold straight away. Very pleased. It looks like you really beefed them up a bit…I like it better this way. Did you cut the fret work all the way through the front? Larry Yes the Tulip is cut all the way through. This is a scrollsaw project made in 3 parts and laminated clamped together. So the fronts are drilled and scroll sawn glued & clamped for 24 hours then sanded to finish. I use tightbond 3 on glue up. I have manipulated the pattern with software and used thicker grade timbers and of coarse decent wood types. Simple design but very effective glad you like them. 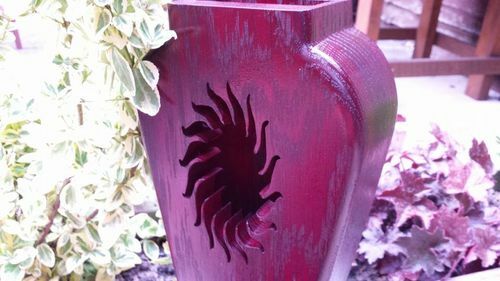 I also posted another vase project 2 days back you may be intersted in that as well. Hey Bazz great work!what sort of scroll saw are you using?did you cut it all with a scrollsaw or just the tulip? Hi Ashe :: I have a used old Hegner multicut one which is around 17 years old, I bought this on E-bay for £170 / $250. Yes its all cut with my scrollsaw , I cut upto 1-3/4 inch timbers “30 – 40 mm” thick including tough timbers like Bubinga. Slow but sure.. Plus both the front & back sides I have run my Palm Router around to soften the image. If you flick through my projects you will see I cut a wide range of inch plus hard woods. I use “NIQUA reverse tooth blades No 5 for just about everything. All my tools are cheep used second hand hobby tools from E-bay. 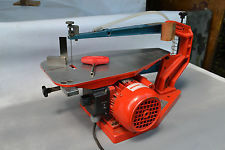 Ashe This is the type of Scrollsaw I use, Almost an Antique Ha Ha its around 17 years old its a Hegner multicut one single speed from a old school via E-bay. This is a stock photo as I dont have any photos of my work shop on this Pc. Axminster sells some good stuff but the Jet in my opinion is poor quality. Thats why I bought a quality second hand unit For £170 rather than a new but low quality unit. I would think it would be a nightmare trying to use a jigsaw ? When useing quality Plane end scroll saw blades they will cut through 300 mm Oak like its hard cheese, so much so you have to take care as to not cut to quickly . If you look on YOUTUBE enter a search for scrollsaw projects you should see plenty to give you some answers. What area do you live in Ashe ? Very cool design and work. Amazing what one finds in those peat bogs !! Wow! Extremely beautiful, nice choice of woods. I love the woods you have chosen for these vases, Bazz. Can I ask where you got the Irish Peat Bog Yew? I’ve been looking for some Irish Peat bog oak without paying an arm and a leg! I, too, like the thicker woods you have used on these vases. Beautiful grains! Thanks for sharing.